Kelsey Schaffer makes a bed as Greg Hallett of the 180th Fighter Wing looks on. Swanton seventh graders were put through a Gauntlet last Tuesday testing the skills they have learned as part of the Swanton 7 initiative. Twenty-one students peformed well enough to move on to the next round of the Amazing Shake. Alexia Ostrander talks with Swanton Mayor Ann Roth during the Amazing Shake Competition last Tuesday at Swanton Middle School. 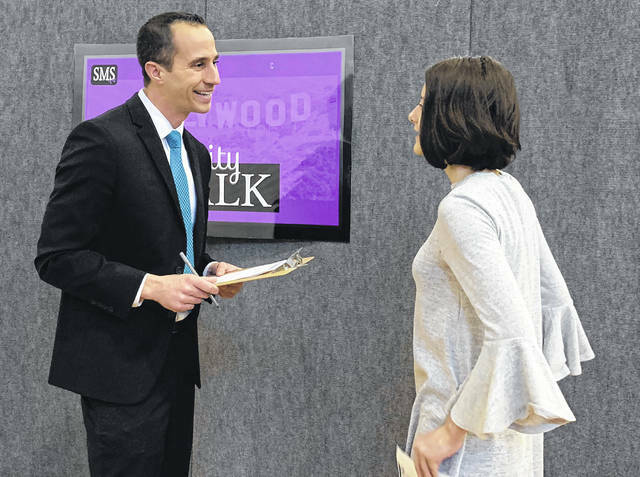 Desiree Poling goes through a station with Chris Vickers, WTOL meteorologist, at the Amazing Shake Competition last Tuesday. Lance Barnes tells Swanton Village Administrator Rosanna Hoelzle the names of the influential figures in the nearby photos. 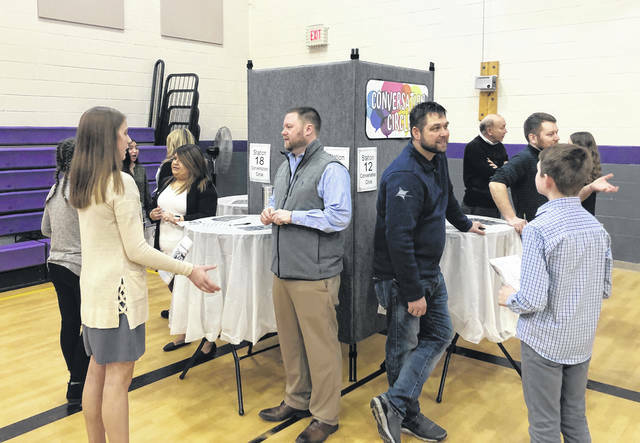 Swanton Middle School seventh grade students put on display Tuesday the skills they have learned as part of the Swanton 7 initiative. With the help of staff and community members, they participated in the school’s first Amazing Shake Competition, which focuses on building soft skills. A strong emphasis was placed on manners, discipline, respect, and professional behavior. The event went fantastically, according to Principal Matt Smith. He added that the community members who stepped up as judges were amazing with the students, and the students blew away the expectations of school leaders. Students went through the Gauntlet, which had seven stations that put their abilities to the test. They had to show poise and confidence in personal interactions, as well as exhibit effective management skills. Swanton Village Administrator Rosanna Hoelzle, who was part of the “Know Your News” station, said the Gauntlet was intense but she could tell students were well-prepared. 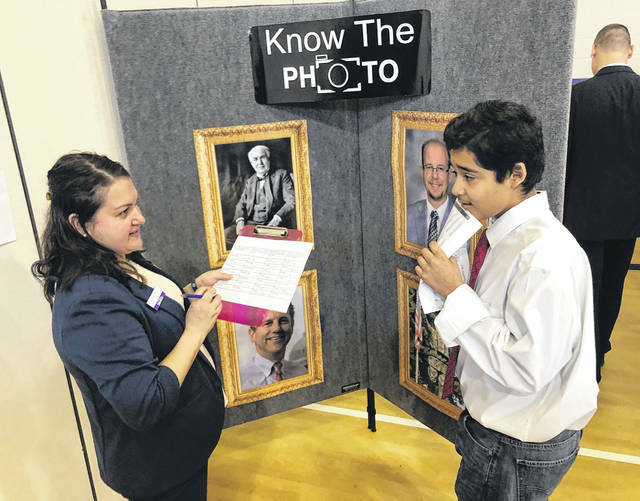 At her station, there were photographs of influential individuals students had to name. Other stations tested students’ communication skills, ability to place a dinner order, dining etiquette, knowledge of world events, bed making, and the ability to dress professionally and present themselves in a positive light. School officials expressed thanks to the Fulton County Economic Development Corporation, led by Matt Gilroy and Kelly Carey, for helping to find over 50 judges for the event. The top 21 students move on to the second round of the competition in April. There will be a total of four rounds, which will get more intense until a winner is crowned in May. https://www.swantonenterprise.com/wp-content/uploads/sites/23/2019/03/web1_Swanton-Shake-Bed.jpgKelsey Schaffer makes a bed as Greg Hallett of the 180th Fighter Wing looks on. 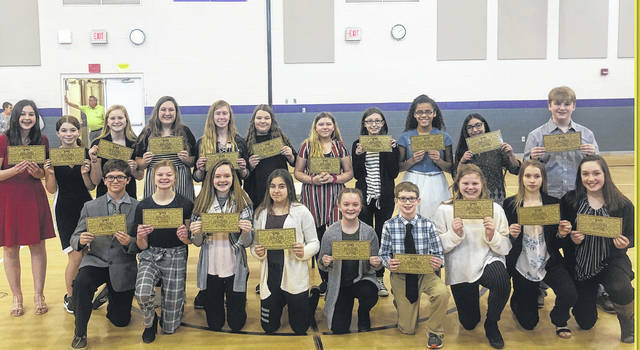 https://www.swantonenterprise.com/wp-content/uploads/sites/23/2019/03/web1_Swanton-Shake-Convo.jpgSwanton seventh graders were put through a Gauntlet last Tuesday testing the skills they have learned as part of the Swanton 7 initiative.